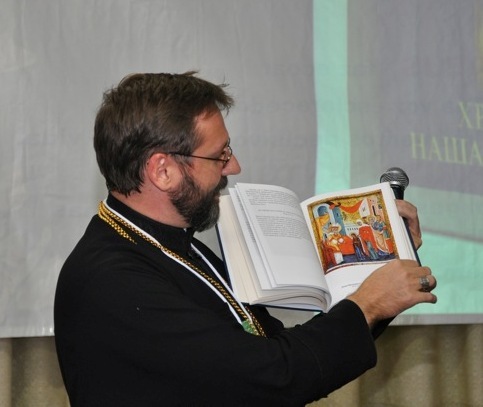 In June of this year, after ten years of preparation, the Ukrainian Greek Catholic Church (UGCC) –the largest Eastern Catholic Church in union with the Pope of Rome– released its first official Catechism. Entitled Christ our Pascha, it received the unanimous support of all the Bishops of the Ukrainian Catholic Church and also was reviewed by the Eastern Congregation in Rome before publication. A description of the development process by the Patriarchal Catechetical Commission can be read here. Translation into other languages is proceeding, including Spanish, Russian, Portuguese and English. There was speculation that the new Catechism might present some nuanced understandings of some of the issues that divide the Catholic and Orthodox Churches, especially with regards to the role of the papacy. However, some rough, unofficial translations of key paragraphs in the new UGCC Catechism indicate that this is not a breakthrough document that might suggest a way to resolve the doctrinal differences. 291. Each local congregation in administering the Eucharist by its bishop and through community of faith comes into communion with the other local congregations. Local congregations being in communion form the Local Church headed by a primate – a bishop, archbishop, metropolitan or patriarch. The first among the local Churches is the Roman Church, since it has the Pope of Rome – a successor of Apostle Peter – as its primate. He is the teacher and the rule of the apostolic faith, to whom the Lord gives a gift of infallibility in the matters of faith and morals. Just as apostle Peter expressed a love to Christ that was greater than that of the others and received a commission from Christ to tend his flock (cf. Jn 21:15-18), so the Roman Peter’s Chair “presides in love”244 and holds primacy among the local churches245. This primacy is effected through Peter’s ministry of the Roman bishops, which our Church confesses in the title “The Most Holy Universal Hierarch”. It is important to note again that the translations provided here are unofficial. I would welcome input from those who know Ukrainian who might offer improvements in the translation. It does seem clear, however, that by citing both Pastor Aeternus from Vatican I and Lumen Gentium from Vatican II the traditional doctrines of papal infallibility and primacy taught at those Councils are being reaffirmed in the new UGCC Catechism. 293. Christ entrusts the ministry of Church universality to the apostle Peter: “I have prayed for you that your faith may not fail. And when you have returned, strengthen your brothers.” (Lk. 22:32). The Bishop of Rome – a bearer of Peter’s ministry – convenes Ecumenical Councils, approves of their decisions, ascertains and expresses the infallible doctrines of the Church, resolves difficulties that arise in the life of local Churches. The ministry of the Roman Hierarch testifies of “the most ancient apostolic times”247. His ministry is to “strengthen the brothers” in common faith (cf. Lk. 22:31-42), be a “rock” (cf. Mt. 16:18) and a “shepherd” (cf. Jn. 21:15-18). “It is to him (the Roman Hierarch), in St. Peter, that Jesus Christ passed on the whole authority to tend, manage and take care of the whole Church, as it is established at the Ecumenical Councils and in the sacred canons”248. 247. See Dmytro Tuptalo, Lives of Saints. October 11. Remembering the 7th Ecumenical Council. 248. Council of Florence, Oros. The union decree (available here under the date of July 6, 1439) of the Council of Florence, which was rejected by Orthodoxy as a whole, served as a basis for union of the various Eastern Catholic Churches with Rome. The Florentine decree is cited a few more times in the new UGCC Catechism: in a discussion of the procession of the Holy Spirit (paragraph 98), when discussing Purgatory (paragraph 250), and in discussing East-West unity (paragraph 306). 311. The Church universally confesses that Mary, the Mother of our Lord Jesus Christ, is the Theotokos and Ever-Virgin, and venerates her in the festivals of the liturgical year. In the festivals dedicated to the Theotokos the Church prayerfully commemorates the salvific events from Theotokos’s life: Conception by St. Anna 274, Christmas, Introduction to the Temple, Annunciation, Presentation and Dormition, seeing in her an example for our growing in holiness. 274. The Pope of Rome Pius IX by his bull Ineffabilis Deus (December 8, 1854) proclaimed the dogma on the Immaculate Conception of the Blessed Virgin Mary: “The Most Holy Virgin Mary from the moment of Her very conception by a special blessing and privilege from the Almighty God, in view of the merits of Jesus Christ, the Savior of the human race, was protected against any spot of the original guilt” (DS 2803; also CCC 491). was not written as an ecumenical statement. You cannot speak of ecumenism if you do not know who you are. I suppose this is a starting point for our ecumenical dialogue with others. But at no time did we have ecumenism in mind. Our task was to explain our church as clearly as possible to our people. The official English translation is due out in late 2012. I’m sure that further research on the new UGCC Catechism will reveal many areas of common identity between Eastern Catholics and Orthodox. A future article will go into the new Catechism in greater detail. However, this initial look at the new Catechism indicates that it is solidly in the Catholic tradition and is not to be, as some had hoped, a document suggesting new approaches to issues that divide East and West. 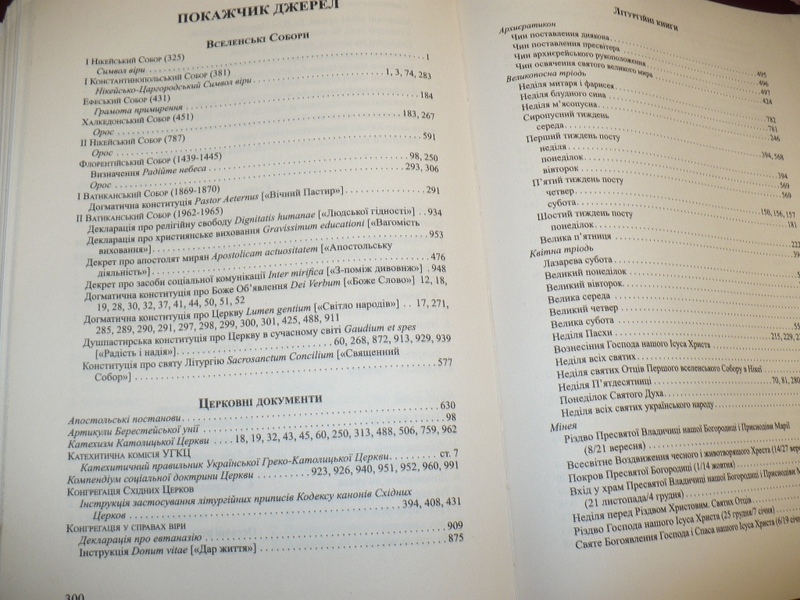 The new UGCC Catechism was released in Ukrainian in June, 2011. Translation into other languages is in process. The English version is due out in late 2012. This entry was posted on Friday, October 14th, 2011 at 9:11 am and is filed under Uncategorized. You can follow any responses to this entry through the RSS 2.0 feed. You can leave a response, or trackback from your own site. “the Roman Peter’s chair ‘presides in love'” sounds very strange. Is this a Roman Peter or a Roman chair? And when you consider the etymology, a chair (sedes) presiding (praesedet) is a bit nonsensical. Please rephrase! I agree it sounds a bit strange. I’m sure the translation can be improved. I invite readers who know Ukrainian and who have the new Catechism to please share possible improvements. This catechism sounds too Latinized for it to be a useful resource on Eastern Christian theology. Alas another lost opportunity. Well, on the other hand, it remains clear that what is orthodox about Byzantine Rite Uniate churches is the Liturgy and iconography, but not the ecclesiology, doctrine and mindset, which rather remains solidly Roman Catholic. Perhaps this clarity will at least lead more Orthodox-leaning Greek Catholics to return to the Orthodox fold? It is a pity they missed an opportunity here, but I do think the expectations of many were too high. To be honest, I’m not sure any of the Eastern Catholic churches is presently capable of producing a forcefully Orthodox statement of faith. 1. Eastern Catholic seminaries (some of whom have considerable numbers of Orthodox faculty) are only beginning to instill a truly Byzantine theology in seminarians. There is a rebuilding process occurring in these churches, and 2011 is closer to the beginning than the end of that process. It is a mistake to expect hat a Synod of hierarchs born in the mid 20th century would be capable of overcoming the rampant theological latinization of previous decades. 2. Furthermore, the Congregation for the Eastern Churches is still too powerful and consistently interventionist in the affairs of Eastern Catholics (why does a congregation led by a Latin cardinal have final say in a publication approved by the Ukrainian Synod?). All must have patience with the Eastern Catholic churches. They know they are in a difficult situation. And, I will add for Orthodox readers: disparagement and open hopes that some will defect from Eastern Catholic churches will only exasperate this issue. Many Greek Catholic clergy and laity oppose elements that are perceived as “too Orthodox” because of historical rivalry and negative historical associations. Karen’s comment, while well intended, does not appreciate that the return of a few “more” Eastern Christians to the Orthodox fold is not a lasting, fruitful solution, anymore than the Unitatism of past centuries was. Rather, all must pray for the revitalization of the entire Byzantine faith, ethos, and practice among all Greek Catholics, and the unity of all Eastern Christians on a common confession of the Orthodox faith. Attempts to undermine the Greek Catholic churches only encourages those forces that work against the Orthodox-minded in those churches, and perpetuates this painful division in the Christian East. Some good points. Still, as much as I’ve seen encouragement in authoritative Catholic documents for Eastern Catholics to “return to their traditions,” I’ve not seen any indication yet that ‘returning to the Eastern theology of ecclesiology’ was to be encouraged. The Eastern Catholic Code of Canons is a good case in point. From all the sources I’ve read, Rome seems to expect Eastern Catholics to accept without question the Western model of ecclesiology. The new UGCC Catechism appears to be another indication that the Latin Church’s view on ecclesiology is non-negotiable for Eastern Catholics. I agree to a great degree. Certainly, it is something for which Eastern Catholics must still fight, and that fight is far from won. I am reminded of (the Melkite) Patriarch Maximos IV’s many addresses at the II Vatican Council, defending many points of Eastern ecclesiology, and decades later, the ecclesiology expressed by the Zoghby Initiative, approved by the Synod of the Melkite Patriarchate: recognizing [the bishop of Rome as] “first among the bishops, according to the limits recognized by the Holy Fathers of the East during the first millennium.” Naturally, Rome did not approve all (or even most) aspects of these initiatives (the latter especially couched in Orthodox terms), but the fact that they were championed nonetheless is a credit to the integrity and faith of the Melkite Catholic Church. Even if this catechism represents a missed opportunity, developments within the Greek Catholic churches are still tending in a positive–an Orthodox–direction, and I believe we will see the fruits of these in future decades. We must continue to pray for the unity of Eastern Christians, end encourage all that is Orthodox in the Eastern Catholic churches towards that end. This Catechism show that eastern tradition do not contradict to western. Thank you, Anatolij, for your comments. The citation on the Immaculate Conception seems to present the doctrine in its Western explanation. Does the new UGCC Catechism present the Eastern perspective on Original Sin? Also, what does the new Catechism say about the Filioque? Could you share more about that? Aside from the Melkites and their upholding of the Zoghby Proposal are there any other Eastern Catholic Churches which have indicated they are moving in the direction of Orthodox ecclesiology? (I realize, however, that the Melkites are still bound by the Eastern Code of Canons so they are still practicing the Western ecclesiological model.) It seems to me that the rest of the Eastern Catholic Churches seem content to leave things as they are and live by the Eastern Code. But again, where you will especially see an Orthodox ecclesiology taking root is in the Seminaries, where there are often many Orthodox on faculty, and where Eastern Catholic professors are championing a return to their roots. Also, look at the speeches and proposals that came out of the recent Middle East Synod. Anatolij, Thanks! I’ll look forward to that!